The Canadian network CTV has renewed Flashpoint for a second season and will go back into production in early 2009. Will CBS viewers get to see year two as well? Flashpoint began as a CTV project that encouraged actors to submit scripts to the network. It was originally conceived as a two-hour movie but was reworked into a series in December 2007. The following month, during the writers strike, CBS purchased the rights to air Flashpoint’s initial 13 episodes in the states. 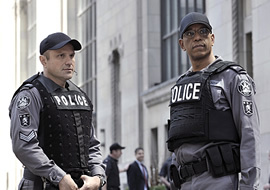 The series debuted on CBS on July 11th and follows the challenges of the Strategic Response Unit (SRU), an elite group of Canadian police who are assigned extremely dangerous situations. It’s the first Canadian series to air in U.S. primetime since Due South, nearly 10 years ago. Flashpoint’s premiere attracted 8.1 million viewers; a solid performance considering it aired on a Friday night in the summer months. Though the following week’s episode dropped to 7.1 million, CBS was encouraged by the numbers. They shifted later episodes to Thursday nights, switching places with ailing Swingtown. For the next five weeks, Flashpoint’s viewership averaged 6.8 million. Flashpoint’s been off the air since August 21st and is scheduled to return on September 11th. Now that CTV has renewed the series for a second season, it’s probable that CBS will buy in for year two as well. Depending Flashpoint’s performance in September will likely determine when/if we’ll see season two in the states. Based on the show’s performance to date, a Summer 2009 return seems the likeliest choice. Stay tuned! Photo: Ben Mark Holzberg/CBS ?2008 CBS Broadcasting Inc. All Rights Reserved.